We are engaged in offering a wide range of Stepper Motors that are suitable for variety of industrial applications. These are manufactured using premium quality raw material and are appreciated for their easy, trouble free and vibration free operation with longer service life. 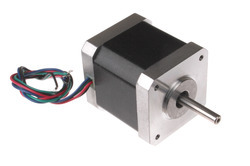 We supply wide range of Stepper motors which are used in diverse applications. We also offer complete range of solutions with stepper control system.